We go into these topics in detail in our Confined Space Train the Trainer classes. Alternate entry (reclassification) or full permit entry? Let's start with the name: Reclassification. Last April I presented a talk at Oregon's Governor's Safety Conference on evaluating your facility to determine the level of rescue capability needed. The feedback for almost everyone was very positive, but one participant was a little peeved by my reference to "confined space reclassification." On the session evaluation he noted that he taught confined space safety and felt that using this term (which he said did not appear in the standard) created major misunderstandings in the public, or at least those members of the public who have ever heard of a permit space. Point taken, somewhat. In paragraph (c) (7) the confined space regulations do say that a permit space may be "reclassified to a non-permit space" under certain conditions, but I agree that the term "reclassified permit space" does create confusion. The problem is that people think that you reclassify a permit space when you initially assess the hazards and determine if it is a confined or permit-required space. Not true. You survey your facility (or construction site) and make a note of any confined spaces that employees may have to enter (i.e., spaces that are big enough to get into and work, tough to get in or out of, and weren't designed to have people inside working). Then you see which of these spaces have a serious hazard (actual or possible) that can prevent the entrants from performing a self-rescue. These are your permit-required spaces. 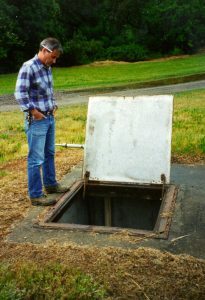 These permit-required confined spaces go on your inventory of permit spaces in your written program. They are always going to be permit spaces unless they are reconfigured somehow. So how do we reclassify them? You don't (at least not yet). And this is where I think my commenter had a valid point. Many people think that reclassification is something that's done with the words you use in your written program, done on paper as it were. People often tell me, "we have reclassified all our spaces" which is not true (unless they are all being entered at that moment). While you might indicate which permit spaces are eligible for being downgraded, the only time a space is no longer a permit space is after you have completed special steps, also known as Alternate Entry Procedures. Once these procedures have been performed, then your permit space has been converted into a non-permit required space, and it will stay a non-permit space until the space is vacated and returned to service. At that point it's a permit space again. Which spaces can we enter under alternate entry procedures? This question has gotten a little trickier to answer with the issuance of Federal OSHA's confined space standard for contruction and, to a lesser extent, Oregon OSHA's (OAR 437-002-0146) revamped permit space rule. If you are complying with the federal rules (29 CFR 1910.146), they are pretty adamant that if the permit space in question has both a hazardous atmosphere and some other physical hazard, then you can't reclassify. If you only have a hazardous atmosphere then you follow the requirements in paragraph (c) (5). If you don't have a hazardous atmosphere and can isolate the hazard without entering the space (e.g., draining a water tank before entry), then you follow (c) (7). Note that the term 'isolate' has a very specific definition in the regulations. It refers to the "process by which a space is removed from service and completely protected against the release of energy and material into the space by such means as: blanking or blinding; misaligning or removing sections of lines, pipes, or ducts; a double block and bleed system; lockout or tagout of all sources of energy, or blockiing or disconnecting all mechanical linkages." Under the Oregon OSHA and the federal rules for construction you can now control a hazardous atmosphere and then eliminate the other hazards. So it's possible that an employer could send a worker out alone to clean a tank. Loaded down with a ventilator, air monitor, locks, skillet blinds, and lights this person could open the vessel, take care of the hazards, jump into the tank, do the work and get out all without the support provided by the permit process and the safety provided by an attendant and retrieval or rescue system. But the question remains: Which spaces can be reclassified? The simplest answer is that a permit space which can be made safe to enter with one or two simple steps (performed from outside the space) would be a good candidate for alternate entry procedures. And while the benefits to the employer of using alternate entry (no need for an attendant, permit, entry supervisor, or means of rescue) are attractive, we should remember that hundreds of people have died in spaces that could have legally been entered using alternate entry procedures. The problem is often the result of work-caused hazards that were not evaluated properly prior to entry or some type of upset condition created a situation which the workers responded to inappropriately. As I indicated there are a number of facets to the issue and we will be exploring them in future posts.